Beginner here, your advices welcomed! I am discovering the wonderful world of ios music. Having big fun with Animoog, iSEM, Ruismaker, Elastic drum, Fugue machine etc mainly in AUM. 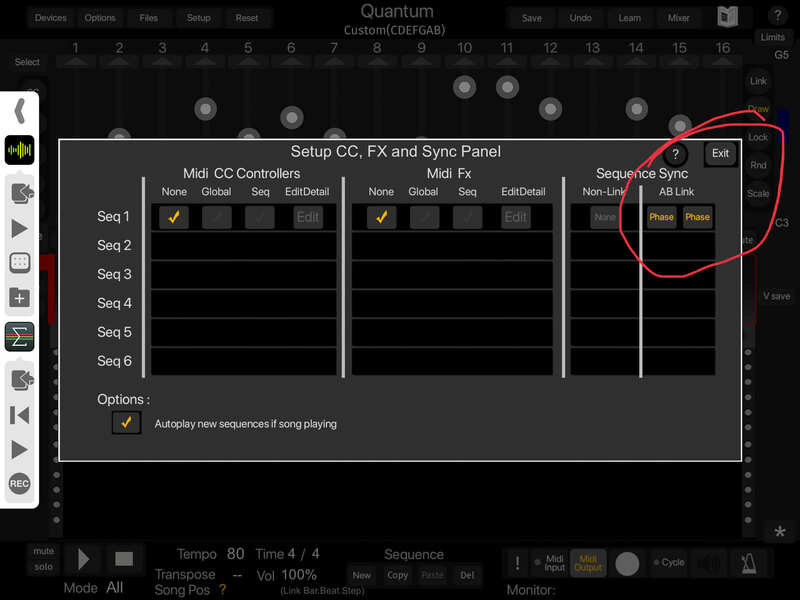 I was in search of a step sequencer and got Quantum as it seems to fill my needs. However I cannot make it properly run in sync in AUM. I am in Ableton Link mode and there is a big latency, like a half note. I have tried to mess with the options in Quantum, but with no success. I could not find an answer on the web. I think you might have to turn Link off for Quantum, and let it use the IAA sync from AUM instead (by hosting Quantum inside AUM). The latest version of Link is supposed to have Start/stop in sync functionality, but I guess that is not supported by both these apps yet. Personally, I use Audiobus to host non-AU apps (like Quantum) in conjunction with AUM. In addition to state saving that allows your whole setup to be recalled and the sidebar / Audiobus Remote for remote control of background apps, it has a global transport that works very well. Half of what note at what tempo? If you're writing about a major delay, it's probably just that AUM and Quantum are not in the same phase and starting offset from each other. In the Setup panel you can set Ableton Link Sequence Sync for each of the six sequencers to Phase, Beat or none. Make sure it's set to what you want. If you're writing about a subtle delay: There was a change in the timing engine for Quantum a while ago that resulted in a timing drift error. The latest version 1.10 resolves the timing drift, but I have noticed that while the timing is consistent, it is consistently late. My personal tests show this is not a massive amount (about 1/32 note at 60 bpm), but enough to notice flamming. I can adjust the Link pre-roll to 0.09 and get the timing correct; unfortunately that setting isn't persistent, so it has to be set for each session. @midiSequencer pretty please make it persistent! Thank you both for your kind answers. However I am still unable to have Quantum starting in time, in AUM . In audiobus it's even worse as I just have no sound at all. I guess I must have messed with the numerous options in Quantum. Pitty that the user manual is of no use at all in this regard. I would be gratefull if somebody could post screen caps of the correct setting. Thank you both for your kind answers. 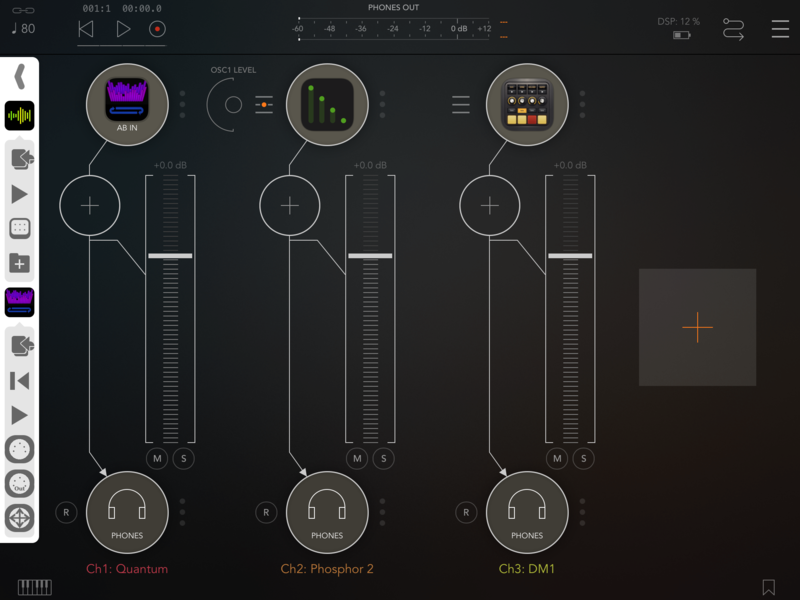 I will try Quantum in Audiobus to see if it works better. I use personally use Link. I know that IAA sync is technically better, but I don't always want to have all my sequencers start at the same time. The Audiobus start is useful when I want to do that, otherwise I start sequencers manually to bring things in as needed. Also when I try to change setting in Quantum's option it asks me to "stop sequencer playing first" even when the sequencer IS not playing, so I have to quit Quantum totally before beeing able to change anything. Actually Quantum is not even in sync with it's own metronome! Maybe that tells someone something ? Well that's weird if it's actually not running. Not in sync how? Correct tempo but off the count or different tempo? I am not able to give a detailed response now but somewhere in Quantum's settings there is an option to turn on MMC which is how AUM transport is controlled (I think). In AUM you have to turn on MMC and select Quantum for midi control. In Quantum you have to set the sync option to Phase (I think, sorry not near an ios device at the moment). You may have to change count in and sync settings in AUM. This allows Quantum to start AUM playing but I'm not sure whether AUM will start Quantum. If Quantum's metronome is not in time with itself then you may have changed some other settings which may need to be reset back to default. Ok thanks I'll try again and again. Quantum is just what I need and I really want to make it work. I'll try to send screen shots later. Best sync is with Link. Go into Options, tap top button to turn all Link options on in the pop up . Note: next to this button is a rotary to enable you to play a little ahead of Link timeline. 0.07 is supposed to be a good value. Go into Setup - look at the last two columns (AB Link) and set these to Phrase (so sync should be to the bar, other values are beat or None for no sync). Setup your synth in AUM - they can use Quantum as an input - its the default output of Quantum. Press Song Play (> button bottom left of the main screen) - it should say Play with Ableton Link. The Song Pos is yellow to also indicate its Link (rather than white). This is all without playing the Host transport. If thats not working tell me your host sampleRate etc. Did you change the sequencer's tempo division? Towards the bottom left of each sequencer rack there's "Tempo" and next to it should be "1/1" by default. With the default common time signature (4/4) each step would be a 16th note, so the metronome will be on steps 1, 5, 9 and 13. If you have a triplet or dotted division for the Tempo division value (any fraction with a D or T appended; e.g. "1/1D" or "1/1T") the steps won't line up as simply; they'll be 3/2x or 2/3x the base value. I use Audiobus to start AUM and Quantum in sync, using Link. I just load up the 2 apps in Audiobus even if I want to host most of the other apps in AUM. I use the Audiobus play button to start everything. You still have to rewind in each app though. In Quantum, in the Settings panel, turn on Link here by setting it to Phase. Remember to do this for each rack/sequence. I only have one here. In AUM, I have Quantum connected to Phosphor through the AUM Midi Matrix. I have DM1 set for IAA tempo sync, so it starts when AUM starts. So just remember to use the Audiobus play button in the side toolbar when you are working in AUM. If you hit the AUM play button at the top (probably from habit) then Quantum won’t start, just AUM. Also, remember to hit rewind in each app when you need to start from the beginning. 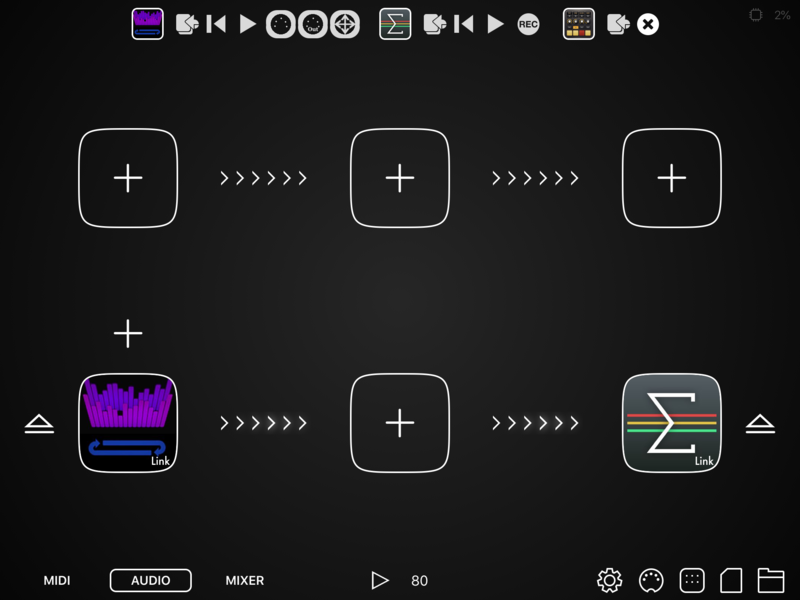 You can also use the Audiobus side toolbar to rewind the apps in their little control sections. Thanks lot @midiSequencer and @Cracklepot ! To be sure I run the same kick (ruismaker) one from Quantum and one from Ruismaker own sequencer. I set "link set up & pre-roll" on 0.10. It starts right and starts to shift slightly very soon.. That was with 256 sample rate. So definitely shifting makes it unusable. Thanks lot midiSequencer and Cracklepot ! So today I follow your steps, and Quantum behaves much better! I set "link set up & pre-roll" on 0.10. It starts right and starts to shift slightly after some time... That was with 256 sample rate. So thank you again! I really appreciate this forum!! Obvious question, but you’re up-to-date with Quantum, right? Prior to 1.10 (and starting with 1.7) there was a timing rate issue where Quantum was rushing or lagging and going out of sync over time. Since 1.10 it has, in my tests, been stable; there’s an offset, but that can be fixed with the preroll setting. I’m hosting Quantum in Audiobus 2, running with 512 frame latency on an iPad Pro 9.7 running iOS 12.1 and have done timing tests lasting 15 minutes. Specs, screenshots of settings and video of the issue would help figure out what’s happening here. @aplourde thank you for your comment. I have tried to play with offset setting but it quickly drift off anyway. I'll try to post some pics/videos this week.